Mackenzie's Land and Black's Land. Sketch plans. Scanned image of E 42761. Arkland. This block of five 'Great Houses' was built to Robert Mylne's designs by the mason John Marr in 1774-5 to house tenants from the Old Town (en.17). It measures 57.6m by 9.6m over all and is of three storeys. The division into five 'houses', each of three bays, is evident in the window-spacing and in the massive chimney-stacks with moulded copings that surmount the flue-bearing dividing-walls. The E elevation is, however, uniform in level, despite the natural slope of over 1.2m to the S, and the doorway at that end of the block is reached by stone steps. The door- and window dressings are of Dumbarton sandstone, slightly rounded at the arris and now painted black. Each 'house' has a central doorway serving the ground floor, and access to the upper floors is by an external stone stair at the rear, into a rectangular hip-roofed projection containing a lobby and sculleries (en.18*). An internal timber stair of double quarter-turn plan, now replaced, led to the second floor. 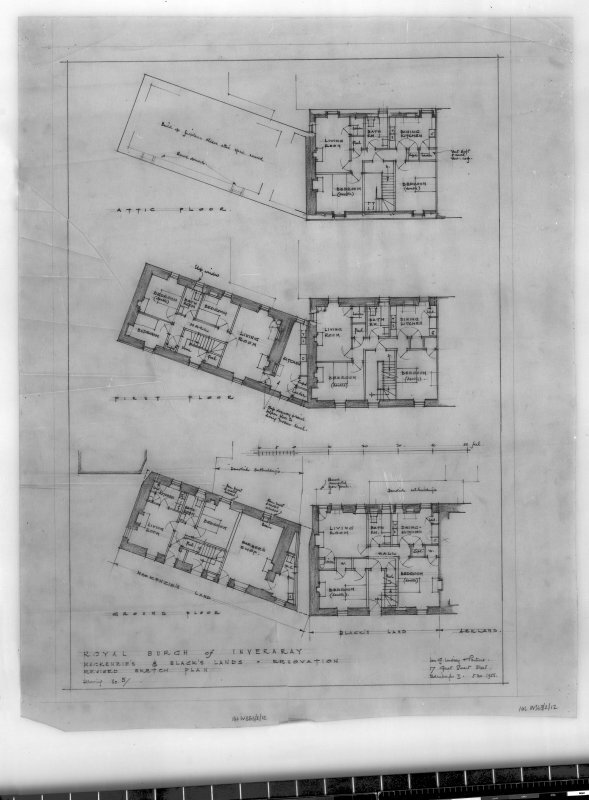 The ground floors each comprised two dwellings, and a central dividing-corridor is still identifiable in the S house whereas the others, some now converted into shops, had shared entrance-lobbies at front and rear. The first and second floors of each house formed single dwellings having four rooms of approximately equal size and a smaller central one at the front. Few early features are preserved, but on the first floor of the N house an elliptical timber arch opens from the SE room into the central one. A tall window in the N gable-wall at this level is probably an early 19th-centuryinsertion. The W side of the lane at the rear of Arkland is occupied mainly by outhouses but includes an almost square two-storeyed building with a three-bay 11.6m frontage, known as Arkland II, which appears to be of early 19th-century date. It contains four rooms with fireplaces at each level including the garret, which was lit by skylights and by small windows in the gable-wall. Black's Land. 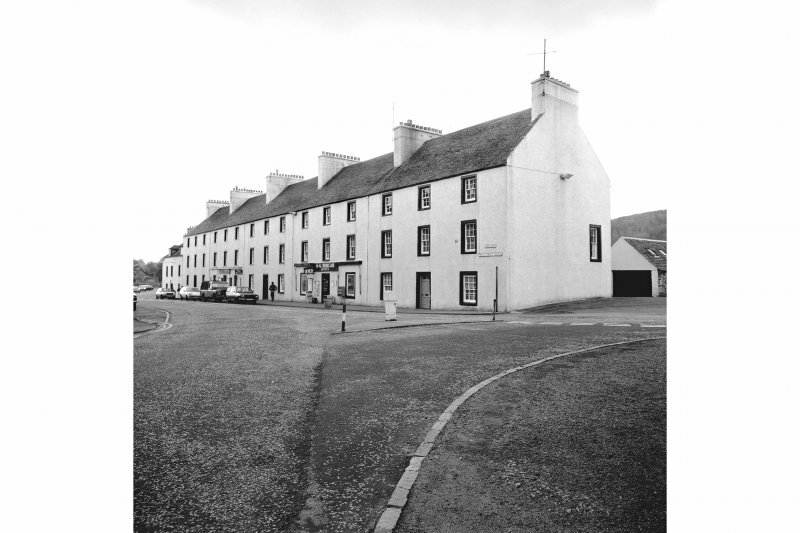 This house, with three-bay 11.3m frontage, was built about 1777 to continue the line of the side-walls of Arkland towards the obliquely-set property to the S. It is built at the same ground-level as the latter, but has slightly taller windows and a higher wall-head. Mackenzie's Land. This house, as built by Neil McCallum, the Argyll estate wright, in 1775, measured 14m from NE to SW by 7m and had a three-bay frontage with central doorway. Two additional doorways and a small ground-floor window were subsequently added, and the space of 4m between the NE gable and the S gable of Black's Land was filled by an addition of the same height, containing a ground-floor doorway to a pend, and a window at each level. Cross Houses. This 1 1/2-storeyed range, running at right angles to the line of Main Street, was built in 1776-7 by the mason John Brown to house Argyll estate tenants. Its NE angle is placed close to the SW angle of Mackenzie's Land, and it extends W to the Avenue Wall, measuring 31.5m by5.3m. It is divided into three three-bay units facing S, each with a central doorway, and an additional single bay at the W end. The existing part-hipped roof is of late 19th-centurydate. Each unit contained two rooms divided by a lobby and a straight central loft stair, but some of these rooms were subdivided during the restoration of about 1958, and the ingle W bay was added to the adjacent house. In 1868 there were two wider and slightly shorter parallel ranges to the S, probably also built in 1776-7. Both are now incorporated in a garage, the N one as a shell and the other as a much-altered hip-roofed two-storeyed range (en.19*). Gasworks (site). Immediately S of the range of buildings just described there is an almost triangular site divided into two yards, the N one now roofed over. The site retains several of the buildings of the Inveraray Gasworks, established by the Argyll estate in 1841, modernised in 1949 and closed in1964. At the latter date it retained much of its original plant, including two original gasholders in the S yard and a retort-house with fireproof roof in the SW angle of the N yard (en.20). The yards were divided by an angled L-plan range whose hip-roofed E limb, which presents a two-storeyed three-bay E front to South Main Street, was the works-attendant's house, while the W part was the purifier house. Some of the buildings may have been adapted from existing ones, and parts of the site were occupied in 1841 by the 'old brewery' and the 'f1eshmarket’ (en.21). A small group of sheds, including a19th-century smithy which remains in use, occupies the triangle S of the gasworks, bounded by the Avenue Wall on the wand the road on the E.